[ENGLISH] Jose Sarasola shrugs off Maria Ozawa-Cesar Montano "one-night stand"
Jose Sarasola on past issue about girlfriend Maria Ozawa's supposed one-night stand with Cesar Montano: "The fact that she said it's not true, it makes sense to me na she could've admitted it, and she also could not have admitted it, pero tanggap ko naman kasi past naman, e. Di ko pa siya kilala nun, e. I can't control her past." FOR THE TAGALOG VERSION, CLICK HERE. Jose Sarasola can’t be bothered that his Japanese girlfriend Maria Ozawa was at one time linked to actor Cesar Montano. The Filipino-Spanish chef-actor said, “It happened before I met her. Maria and Cesar were the main stars of Nilalang, an official entry in the 2015 Metro Manila Film Festival. Three months after the filmfest, the adult film actress was interviewed by Mo Twister for his podcast, Good Times With Mo, on March 1, 2016. Mo asked a direct question, did Maria sleep with her co-actor when they were doing their movie? She laughed and ignored the question. Mo persisted, how many times did they do it? Two days later, on March 3, 2016, Maria recanted. She posted a message on Twitter to say her supposed one-night stand with Cesar did not happen, she was only joking. 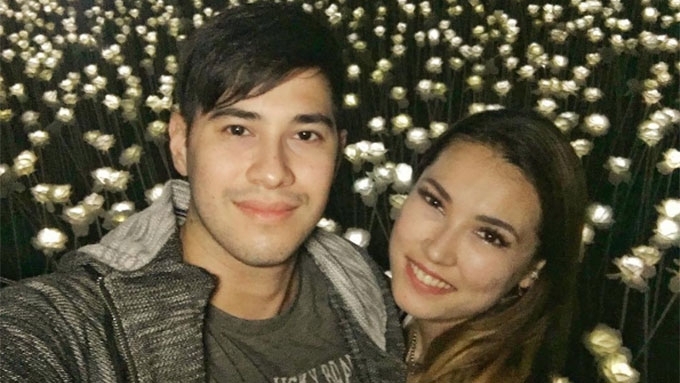 Maria Ozawa: No one-night stand with Cesar. It was a joke! But even if did happen, it’s no skin off Jose’s back. “Wala ding mali sa akin, e,” he shrugged. “The fact that she said it’s not true, it makes sense to me na she could’ve admitted it. “And she also could not have admitted it, pero tanggap ko naman kasi past naman, e.
“Di ko pa siya kilala nun, e, I can’t control her past. Jose sat down with PEP.ph (Philippine Entertainment Portal) for an exclusive interview last Friday, May 12. The former Pinoy Fear Factor contestant related he and Maria had talked about her podcast interview. “Very delicate situation, very iffy situation. “Pag may mga ganung biruan, nagiging big deal sa Pilipinas, e.
According to Jose, “Well, she told me for a fact na it’s not true. It was a joke lang. “But siyempre, yung mga jokes sa Pilipinas, tapos yung mga ganyan, with Maria Ozawa pa.
“Magiging big deal talaga, nag-iiba yung story. “Natu-twist ng konti yung kalabasan ng katotohanan. WORKING TOGETHER. Jose are Maria are both actors, so there’s a chance they may find themselves together in one project. He liked the idea, “That would be fun. “Maybe sa ngayon, mga interviews together. “But yung mga taping, shooting ng mga TV series, movie, wala pa namang offer. “Pero kung sakali, why not? “It’ll be easy to work with her kasi girlfriend ko naman. Second-guessing his girlfriend, Jose said Maria will not have a problem working with him, “I think she’ll be at ease. "At least alam niyang co-star niya is someone who’s very supportive, someone who loves her. “Hindi naman siguro magiging issue. Feeling ko naman, game naman yun.